I have, predictably enough, a bunch of books about perfumes and perfumery which I like read, and also to refer to when I need to know something about a scent. What is it, exactly, about fragrance that sends so many writers completely over the top? Have they spent so much time sniffing that their limbic systems are in a continual state of hyper-excitation, rendering them unable to think and write straight? Every so often a scent is launched which is supposed to smell of the odorata sexualis of a woman. This actually does. Remarkably--to some, repugnantly--it reeks of a woman's sexual juices. Now, the last time I was within sniffing distance of a lady's private region was the day I was born, and I had other things on my mind, so I can't say I remember what it might have smelled like, but I am fairly certain that this wasn't it. If Irvine is right, when I wear Ambre Sultan, I smell either like I've just done the deed with a lady, or I am in fact a lady myself, and I'm willing to bet that neither of these things is true. Top: Oregano, bay leaf, coriander, myrtle. Base: Labdanum, styrax, Tolu balsam, benzoin, sandalwood. You can tell from that list of notes that you're looking at a classic amber-based oriental, and you are. The top is a crisp little fusillade of herbal notes, almost immediately swamped and overcome by that benzoin, and then begins the long, slow, sighing ascent into ambergris heaven. There's a lot more than ambergris: other notes seem to appear and disappear from time to time, including a dark wisp of incense. As do all good Oriental scents, Ambre Sultan lasts forever. Twelve hours after putting it on, I can still smell it clearly if distantly, a haze of benzoin and amber. I don't put fragrance on clothing, but I'm pretty sure that if you did, you'd still be able to smell it in a day, or two, or three. Ambre Sultan puts me in mind, naturally, of Maître Parfumeur et Gantier's Ambre Précieux, my Holy Grail of ambergris scents and, really, of all fragrances (it's the one I would save from a fire). Ambre Sultan is more complex: it has those little filigrees and curlicues of incense and patchouli and herbs, suggesting the tracery of Islamic art. Precisely because it's so busy, I don't find it as magical as the MPG scent, which seems purer, somehow. But make no mistake: they're both spectacular. When people--ordinary, normal people, not scent-crazed addicts such as myself--think of a classic fragrance, they usually think of either Chanel No. 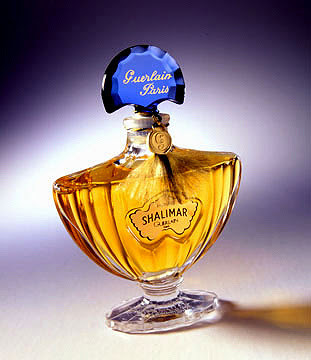 5 or Shalimar, the two great standbys of twentieth-century perfumery. The old, pre-reformulation eau de toilette was a better scent, I think. The newest version of the EDT isn't as good, because to my nose it presents the same problem that Youth Dew does: that hesperidic top note--lemon, bergamot, and mandarin orange--just doesn't seem to fit into the rest of the structure, and I find it unpleasant in its context. (Susan Irvine says it "opens quite violently", and I couldn't have put it better. It is violent.) It takes a while to leave, too: Shalimar takes some time to get down to business, and the lemon note lingers for (in my opinion) much too long as the middle notes are rising to the surface. The centre of the scent is that classic pair of flowers, jasmine and rose. As I find with a great many oriental scents with a floral heart, the flowers are more or less placeholders: they never take centre stage, but fill out the composition. They're there, particularly the jasmine, but they aren't strong enough to propel the scent into the floral, or even the floral-oriental, category. The flowers are damp and sticky with balsams and resins: Shalimar is an oriental, beyond a doubt, and in this case, it's all about vanilla. Oddly enough, my favourite version of Shalimar is the body lotion, or, as they like to call it, Sensual Milky Veil (it's hard not to love that over-the-top French perfume writing and naming): the creaminess of the lotion damps down the top notes, which don't seem so strained, so piercing, and they don't last nearly as long as in the EDT before surrendering to the lushness of what is, really, the über-oriental, the first vanilla scent, the one that started it all. It seems as if the huge majority of new launches in women's fragrance these days are fruity florals. There's nothing necessarily wrong with this. Every age has a scent that speaks to it: late-fourteenth-century Europe was mad about perfumes made of lavender and herbs, a breath of fresh air in an age when bathing was infrequent, and women in Napoleonic France adored the scent of patchouli, an exotic leaf from India which was used there to moth-proof the cashmere shawls which were fashionable among French ladies. For the past ten years or so, the fruity floral has meant young, fresh, and vibrant. The real problem is that as new fragrance launches have accelerated, there are literally hundreds of these scents on the market, and they sometimes seem to be driving out every other sort of mid-range perfumery. You can hardly turn around nowadays without smelling some cheap concoction of lichee and orange-flower or apple, pear and tuberose. But the fruity floral isn't new. Every since chemists learned to synthesize molecules with fruit odours, they've been used in perfumery. Rochas Femme has a heady top note of peach and plum over a bed of roses and jasmine, and that was created in 1944. Peach and plum also star in Van Cleef & Arpels Gem from 1987 (which is probably more oriental than floral). Brosseau's Ombre Rose from 1981 also employs peach and rose (to very different effect), as does Lancome's 1990 Tresor. There are dozens more, maybe hundreds, that predate the current rage for fruit notes. 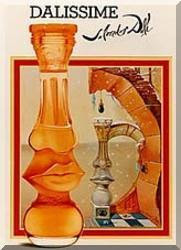 After the extremely successful launch of Salvador Dali in 1984, Cofinluxe began launching new scents at the typically accelerating rate of the modern era: a men's follow-up, Dali Pour Homme, in 1987, a new women's scent, Laguna, in 1991, the men's fragrance Salvador in 1992, and then, starting in 1994, one or two a year up to the present day. 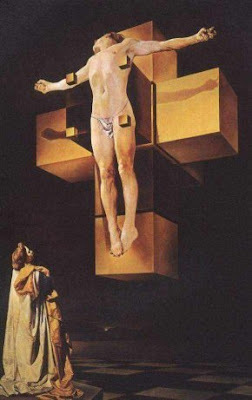 It's a miracle they haven't issued a series of eight scents based on the eight cubes in Dali's famous tesseract crucifix: maybe they're working on it. Their 1994 launch was called Dalissime, and it is without a doubt one of the most purely charming fruity floral scents I've ever smelled. It has an oriental element to it, but there's nothing heavy or cloying about it: it's joyous. The top is a fresh burst of citrus notes (bergamot and, I think, lemon) which arrives just moments before the warm bloom of peach and apricot, plus berries and... cantaloupe? It may be fruit cocktail at this point, but not that cold canned stuff: it's freshly made, and warmed, and there's vanilla sugar sprinkled on top. The floral notes are not as distinct; according to the various lists of official notes, they include rose, jasmine, and freesia. The warm fruit notes remain the dominant force in Dalissime, and they hang around through most of the life of the scent, until finally the oriental base notes--ambered vanilla, grounded in sandalwood--take over. You can't talk about Dali scents without talking about the bottles, because they're always showstoppers, based on elements from his paintings. The first scent was famously based on a disembodied nose and lips from his "Aphrodite of Cnidus", and so is this one, from "Christmas"; in peach-coloured glass, an advertisement of the contents, it's a sort of Greek column made of the same sort of nose and lips, but sitting on a rounded plinth, all surmounted by a capital carved with leaves and vines in the Corinthian style. It's mesmerizing; it practically forces you to hold it and examine it from all angles. The new round of Christmas-themed Method hand soaps has hit the market, more or less. There are three of them: last year's Peppermint Vanilla, plus one called Hollyberry (probably as uninteresting to my nose as last year's Frosted Cranberry) and another called Cinnamon Bark. Unfortunately, only the lattermost one has shown up locally, for reasons I can't guess. I'm very sorry not to be able to get last year's Spiced Pear again, because it was lovely--I'm just about using up the last of it now--and I don't know why the Peppermint Vanilla isn't available here; I would buy a couple of bottles for sure, because I finished up my one bottle months ago. But the Cinnamon Bark is exceptionally good, so I should be thankful to have that. There were exactly two bottles in the Superstore--a Canadian supermarket chain--the other day; I noticed them because, unlike the other Method soaps in their clear bottles, the Christmas releases are a pearlized bottle, very festive. 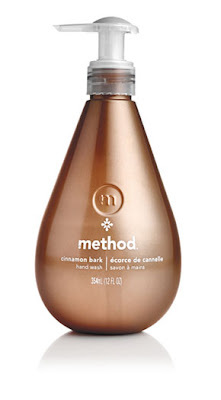 (Also, the Christmas bottles now have a little stylized snowflake just below the embossed Method logo. And also the bottle was brown, a colour I'd never seen before in the Method line.) I bought one; perhaps I'll have to go back tomorrow and snap up the other, if it's still there. Or perhaps, in a spirit of Christmas generosity, I'll leave it for some other lucky soul. Is there a leak in the bottle? I can't find one. Is there some sort of technology that makes the bottle smell like its contents, or did someone smear some of the soap onto the bottle, or is it just so strong that it penetrates the plastic? Because Cinnamon Bark soap is so strongly scented that I can smell it without even using it. An hour after I put the bottle into the bathroom, before I even tried it, I walked in and was puzzled--astounded, really--by the intensity of the scent. It's still there every time I walk in. It doesn't smell like ground cinnamon; that's a Christmastime cliché. It smells more like wood than spice, and although it's clearly a cinnamon scent it smells more like mixed spices than specifically like cinnamon; there definitely seems to be a clove note in there. In fact, it seems like some gorgeous, complex men's scent--not any particular one, but a mélange of the sort of notes you'd usually find in a spicy-woody scent such as Calvin Klein Obsession for Men or Halston Catalyst for Men. And it lasts forever! The scent soaks into your pores and stays there; you can still smell it on your hands a couple of hours later. For a soap, that's a hell of a feat. You can mail-order this stuff, but damn, the shipping is expensive: at best, it doubles the cost of the product. I'll take my chances with finding it locally. Sometimes the universe is telling you to put the brakes on. The Superstore had, in addition to the Method soap, a house brand (President's Choice) in a very boring apothecary-styled bottle; that one was called Honey Cinnamon Kitchen Hand Soap. I bought it despite the boringness of the bottle: I'm not sure why it apparently ought to be in the kitchen, but it's going in my bathroom. It's nothing like the Method Cinnamon Bark soap, for two reasons; first, it smells not of honey or cinnamon but, bafflingly, of Obsession bar soap (the women's version), and second, it leaves no trace of scent on the skin once you've washed it off. Neither of these is a bad thing. Demeter is proof that a good scent doesn't have to be complex or expensive: it just has to have a solid idea and masterful execution. Not all the Demeters are good, of course: there are a couple hundred scents in the line, minimum, and they couldn't all be winners--it just isn't statistically possible (regression to the mean and all that). But there are some gems out there if you're willing to wade through the entire pool of them. 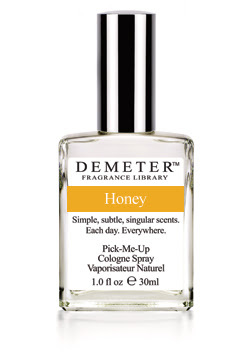 A few days after I tried, and immediately adored, Serge Lutens Miel de Bois, I tried Demeter Honey, having sampled it (briefly) a few of years before and dismissed it: it wasn't to my taste at the time, and it didn't smell like what I thought honey ought to smell like. But years go by, your nose changes, you've smelled more things, you become a little more knowledgeable and sophisticated, and suddenly things to which you wouldn't give the time of day smell very desirable. The Demeter scent is unexpectedly good, a sort of stripped-down version of the Lutens scent, because rather than smelling like a spoonful (or a plastic bearful) of honey, it smells like raw honey, with suggestions of honeycomb, pollen, and wood. It isn't as complex or as magical or as difficult (yes, that's a good thing) as Miel de Bols, but for that price (about $20 an ounce, versus $110 for 1.7 ounces of the Lutens), who cares? It's delicious. 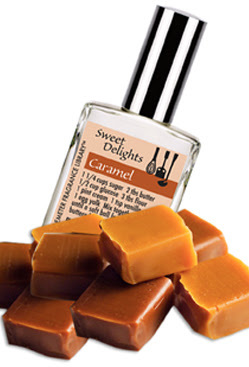 Demeter Caramel isn't as good: it does smell of caramel, but not quite the fresh milky caramel I had been hoping for--there's a slight synthetic edge to it. It isn't as intense as I would want it to be, and it doesn't last as long, either, which is not a surprise in the generally evanescent Demeter line but still a disappointment. 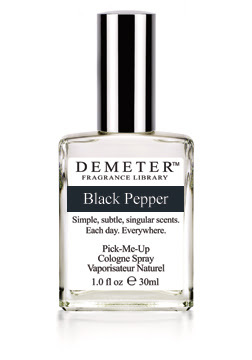 Demeter Black Pepper is also not everything I could have hoped for: it isn't really biting enough. What I wanted was the exact smell of freshly ground black pepper, and it isn't that, because it doesn't smell ground--it's more like peppercorns themselves, without the intoxicating fierceness that's released when they're crushed. On an instinct, I thought, "You know, Caramel plus Black Pepper would probably be smashing", and even though I hardly ever combine commercial scents, I threw on a splash of each, and it's true: together, they're much more than the sum of their parts. They have a synergy: the pepper carves through the synthetic sweetness of the caramel, which bestows a richness on the pepper, and there's a strange and mesmerizing glimpse of pipe tobacco amidst it all. Where did that come from? I don't know, but I love it. I mixed the two half-and-half in an atomizer, and I wear it all the time, because it's cheerful and just a little strange. 1) Cheap is not bad. 2) Sample everything repeatedly, just in case. 3) Mix and match, because you never know. Coconut, as I have noted before, tends to have one of two characteristics in perfumery--to my nose, at least. Either it's warm, sweet, and edible (think coconut cream pie, or a pina colada), or it's biting, greenish, and raw. If I had to wear a coconut scent, it would be the former and not the latter, which I find disagreeable but which some people obviously love. When I first put on Creed's new Virgin Island Water, I smelled bright, sparkly citrus notes (lime, mostly, with a little mandarin and bergamot, all thoroughly delightful), with a baffling, rather industrial undercurrent that, I realized with a shock, smelled remarkably like Play-Doh. This may be a valid commercial scent, since a lot of people have fond memories of the smell of the stuff, but it seems like an odd note for a high-end scent of the sort that Creed produces. The Play-Doh scent welled up and became stronger and stronger, and soon resolved itself into coconut, the harsh green sort I detest. Of course, I thought, fresh coconut: it's meant to smell like someone's holiday in the Virgin Islands. It's not just coconut. There are the obvious island flowers (ylang-ylang and hibiscus) wrapped around it, too. The scent does eventually warm up and smell a little more like the coconut I prefer--not quite toasted, but creamy-sugary--which may be attributable to the sugar-cane note. Once it's past that hideous raw coconut smell, Virgin Island Water isn't a terrible scent. Whether it's worth the stratospheric prices that Creed charges ($185 for a 75-mL bottle) is a matter of personal opinion, but it's not something I would ever consider investing in: it just isn't worth waiting though that baleful opening to get to the good stuff. There are lots of nicer tropical-island scents out there, if one must have one. 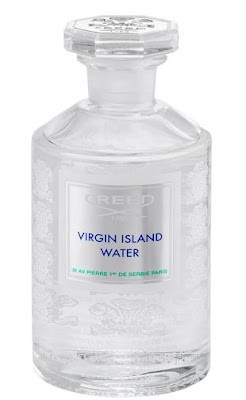 It's worth noting that Virgin Island Water is enormously popular at the moment; you can find many positive reviews of the scent all over the Internet. I'm just paddling my boat against the tide.